When you join a walking tour, you normally join a group. That group assembles at specific times, sometimes only once or twice a month. It moves slowly too, because everybody has to gather up around a guide when she has something to say. If you stop — to take a photo, buy a bottle of water, or tie your shoelaces — you fall behind. If somebody else stops, you have to wait. 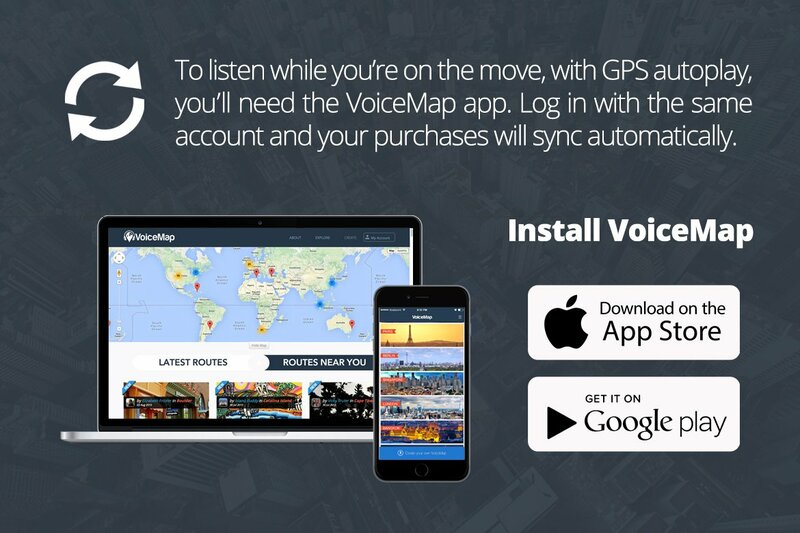 VoiceMap’s walking tour app gives you the freedom to explore at your own pace. You can start our walks at any time and stop whenever and wherever you like, for as long as you like. You don’t even need to hit pause. The app uses your location to play audio automatically, at exactly the right time and place, and when you start moving again, playback will too. It also gives you directions, making it much easier to put your phone away and immerse yourself in your surroundings, not the screen. Your phone’s built-in GPS is accurate to between 5 and 15 metres. Our storytellers use this to make magic, pointing out tiny details at exactly the right time. They use it to give you directions too. You can revisit your walk here, at voicemap.me, where you’ll find a full transcript, satellite photography, and an interactive map. Your comments, ratings and purchases also sync with the two mobile apps, and vice versa. Our iOS app is compatible with your iPhone or iPad 3G, allowing you to keep a walking tour app in your pocket wherever you go. Our walking tour app for Android supports over 4000 devices, including most Samsung phones, and any device that runs Android version 4.0 or above. You can download our audio tours with a single tap before you leave your WiFi zone. They come with offline maps, and you don’t have to pay for data while you’re out exploring. VoiceMap’s walking tour app connects you to a constellation of storytellers. You’ll find tour guides, journalists, broadcasters, podcasters, filmmakers, bloggers, bestselling authors and many more, telling stories about artwork, architecture, current affairs and historical undercurrents, as well as the odd fictional murder mystery and post-apocalyptic nightmare. New audio tours are published every week, all over the world. You’ll find the latest here. You can also choose to receive in-app notifications when new tours are published near you.